The Last Jedi is a lot of things. It’s a war movie, a heist movie, a political allegory, a morality tale, and more. In other words, it’s a Star Wars movie. We’ve already had a number of great articles discussing the film from various angles, but this article is focused on something highlighted in the first face-to-face interaction in the movie between General Leia Organa and Poe Dameron, wherein she comes face to face with her best pilot and surrogate son after he’s just come back from a mission… and slaps him across the face. Let’s look at The Last Jedi as a deconstruction of the traditional ideals of heroism. The character of Poe Dameron was little more than an archetype in The Force Awakens: an ace pilot who is jovial and friendly among his allies, and managed to maintain his banter even while fiery and intense during combat. We see him interact with Lor San Tekka, Kylo Ren and Finn within the opening ten minutes or so, showing us both the humor and warmth, and the focused intensity, that are cornerstones to his character. We also see the reckless determination that seems to inform his every move. Poe jumps right in with Finn without hesitation, then immediately takes the reins from him upon their escape so he can continue his mission. He is the epitome of an old-fashioned film hero, and might well have stepped out of a film serial from the 1930s. The opening combat set piece in The Last Jedi continues that characterization, showing off his incredible skill as a pilot and his determination to earn a victory at any cost. Poe has gone a long way in his career on skill alone, and that’s given him a certain mentality toward his missions, namely that victory in combat outweighs all else. Even as we see him arguing over the comm with General Leia, he sticks with the plan, seeing only the enemy in front of him that he needs to destroy, and draws the pilots of Cobalt Squadron along with him. His efforts lead to the destruction of an enemy dreadnought, but once Poe gets back to the command cruiser, we see that the results are not at all what he expected. 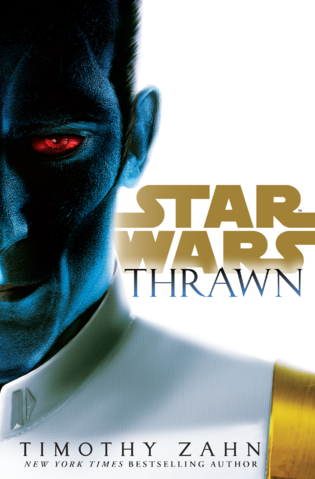 » Read more..
Timothy Zahn made a grand return to the Star Wars canon with his book Thrawn. Its release timing was perfect for publicity, out a scant few days before the opening of Celebration Orlando, but that was part of the reason for a delay in any article on this site actually talking about it. Another reason for that delay is that the book is very good, a return to form for Tim Zahn, so a review would not be all that interesting. A simple quality check of the book would be redundant at this point since we would just be adding a voice to the chorus. 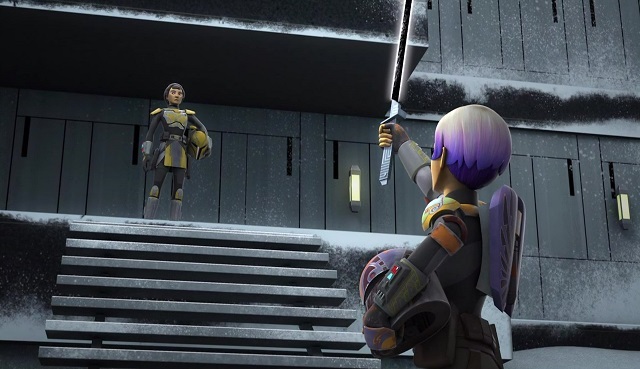 Thus, rather than heap more praise onto it, we intend to instead analyze its portrayal of the two lead characters – Thrawn and Arihnda Pryce – and how they tie into Star Wars Rebels. Be forewarned folks, we’re off the edge of the map. Beyond here, there be spoilers. Thrawn being a part of the Rebels show itself is a topic we have discussed in the past. A topic we have not discussed is that he and Governor Pryce were both formally introduced to Rebels in the same season. Pryce was mentioned previously within the show but never seen, always having excuses made on her behalf by Minister Tua for not attending functions on Lothal herself, almost as if they were intentionally avoiding actually showing her. Then, she walks onscreen scant moments before Thrawn enters the scene. At the time, it just seemed a coincidence, the introduction of new antagonists to replace the ones who ended their journeys in the second season. Ever since Boba Fett first graced screens, whether you count the Holiday Special or The Empire Strikes Back as his debut, the Mandalorian visage, that “T”-shaped visor, all-encompassing armor and jetpack with weapons strapped across every extremity, has intrigued people. From that initial appearance, with as little time spent on him as there was, a whole subculture of the Star Wars fandom grew, even before anyone really knew or codified exactly what “Mandalorian” meant. It was the mystery that drew people in, the very Star-Wars-fan idea of taking something that looked cool and sounded cool and latching on to it, filling in the gaps in the existing storytelling with our own ideas. Since then, there have been several waves of Mandalorian backstory fleshed out, both canon and not, but there has been a main, consistent drive through almost all of them: a warrior culture. In the grand tradition of dozens of other fantasy and sci-fi franchises, the Mandalorians became a Proud Warrior Race, with honor, a clan-based social hierarchy, and a thirst for battle as the cornerstones of their society. This led to problems, of course, because what little we know of Boba Fett showed a man very different from that, and the idea of him being an outlier or social outcast was established early on. Thus, Mandalorian culture left him behind and continued to grow and evolve through its different portrayals, typically in novels and comics. But things did not really start taking off until Jango Fett, Boba’s father, came onto the scene in Attack of the Clones. In establishing Jango’s backstory, the ideas of Mandalorian terrorist groups like the Death Watch, who took the ideals of their culture to their most violent extremes, and of more honorable groups like the Protectors, were first really presented. Also, and just as important in the long run, was the ideal of family. It’s a unique time in the life of Catalyst: A Rogue One Novel. The book is, as the name indicates, a direct tie-in to Rogue One, a movie which is not even out in theaters for another few weeks. We still do not know the extent of how the two works will tie in together, what from one will show up in the other or how much one work may lean on the other for support in character development or story. Thus, this will be an examination of the book on its own merits rather than as a tie-in. Let’s start with overall impressions before we get into what might be considered spoiler territory. 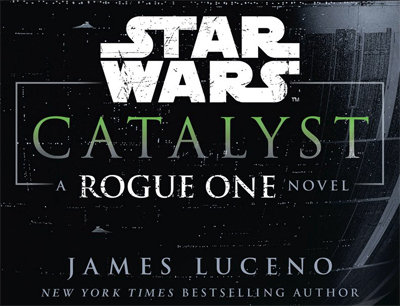 Catalyst is written by James Luceno in the grand tradition of Luceno Star Wars novels, in that it ties to the larger events of a film or other project while still telling its own story. Catalyst is very much a prequel, but it tells its own tale well enough to not need the help of the film to support it. It does, however, give context to larger events by taking us behind the scenes, as it were. In this case, we go behind the scenes of the creation of the Empire’s first superweapon. Through the novel we follow three characters, Galen Erso and his wife Lyra, along with their “friend” and greatest supporter Orson Krennic. The relationship between the three is complicated and ever-evolving as the galaxy spins, events unfold and everything changes around them. We follow our dysfunctional trio from the midst of the Clone Wars through the end of the war to the midst of the Galactic Empire, but the true strength of the book isn’t in the myriad of references or hints at things yet to come; its strength is the leads and the choices they make, the characters themselves bearing the weight of the story. We first see Saw as the self-appointed leader of the resistance against the Separatists on his world, along with his sister Steela and Lux Bonteri, the recurring-not-love-interest to Ahsoka Tano. Saw is a reckless and straightforward sort of person, focused on fighting the enemy and relying on Bonteri and his sister to be the diplomat and voice of reason respectively. He has the infectious enthusiasm to lead, but lacks the tact to soften the blows he strikes for the cause. » Read more..